SEOUL, April 17 (Yonhap) -- The chief of Renault Samsung Motors Corp. has promised to continue investment in South Korea as the Korean unit of Renault S.A. serves as the R&D center for midsize vehicles for the French automaker, Renault Samsung said Wednesday. It is urgent for the company and the union to sign a wage and collective agreement deal for the year 2018 in order to secure production volume for the SM3 compact and the XM3 compact sport utility vehicle for exports to Europe, Signora said. Renault will continue to invest in Renault Samsung as the Korean unit has played a pivotal role in developing the D-segment passenger car models such as the SM6 sedan and the QM6 sport utility vehicle for the French auto group. 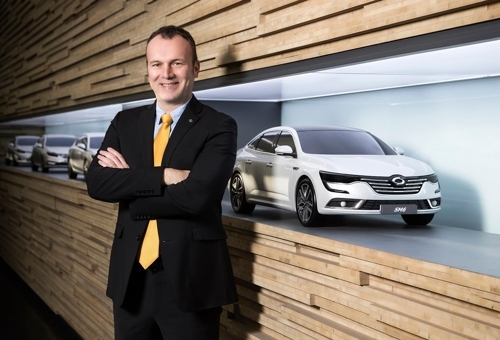 The Busan plant is a core asset for Renault Samsung to remain competitive in Korea, he said. Mayor Oh said Busan city will cooperate with Renault Samsung to resolve the labor dispute. Their meeting came as Renault Samsung announced earlier that it will temporarily halt operations at the Busan plant from April 29 through May 3 due to a drawn-out dispute with its labor union. Renault Samsung and the union have been in a dispute over wages and productivity for the past six months. The union staged 58 rounds of strikes from October through Monday, resulting in production losses of 13,000 vehicles, according to the company. The company wants to maintain a certain output level at the plant by securing export models from its parent company. But the union is more focused on increasing wages and reducing labor intensity. In particular, the company sticks to its plans to outsource the manufacturing of vehicles, if needed, and relocate assembly line workers against their will. The union is strongly against the idea. Renault Samsung produces the SM3 compact, the SM5 midsize sedan, the SM6 upper midsize sedan, the SM7 large sedan, the SM3 Z.E. all-electric car and the QM6 SUV. It also produces Nissan Motor Co.'s Rogue SUV on a manufacturing contract. The QM3 compact SUV is built in Spain and shipped to Korea. The company plans to manufacture the XM3 in Busan for local sales in the first half of 2020. But it expressed concerns that the production may not begin as scheduled due to continued strikes. The union said it will continue to go on strike until the company accepts their demands. "The company has continuously reported profits after 2012 but reduced the workforce. Even if the company secures production orders of SM3 and XM3 for exports, the company said they may outsource the manufacturing of vehicles and relocate workers," union spokesman Nam Ki-tae said. "Outsourcing is to cut costs as well as jobs," he said.